The Oki C710cdtn colour laser printer has a high resolution and quick engine speed. This model comes with standard networking connectivity, making it ideal for workgroups. It also has a high paper handling capacity and a standard duplexer. 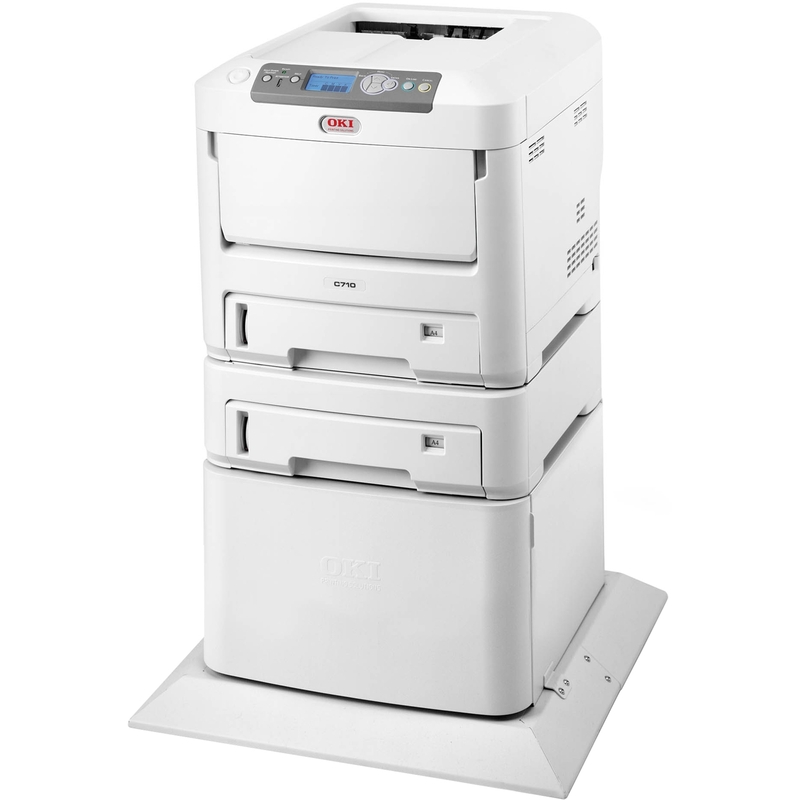 The reliable Oki C710cdtn laser colour printer can deliver 100,000 pages per month. Wi-Fi connectivity isn't offered. The Oki C710cdtn A4 duplex network printer with trays and cabinet is ideal for busy offices as it has a standard cabinet and second paper tray, which allows it to carry a maximum of 1,690 sheets. This model is capable of delivering double-sided prints, thanks to its automatic duplexer. For connectivity, USB, parallel and Ethernet ports are available. The Oki C710cdtn colour printer boasts a maximum resolution of 1200 x 600dpi. Users can expect exceptional colours and fine lines. The print speed of the Oki C710cdtn workgroup laser printer can go as fast as 30ppm for colour and 32ppm for monochrome. This model can be easily shared as it has standard Ethernet connectivity. To be able to handle complex print jobs, there's an option to upgrade the memory of the C710cdtn laser printer to 768MB as well as add a 40GB hard disk drive. More users could access the Oki C-710cdtn printer if it had Wi-Fi. This model needs a better display and could also use a USB host for direct printing.